Are You the Architect of Your own Fortune, or Misfortune? Richard Wiseman of the University of Hertfordshire is a luck expert: In numerous surveys and experiments he has researched what luck actually is and he has published various books and publications in which he advocates that luck is merely an attitude. Those people, who classify themselves as blessed with no luck, get exactly what they expect: hard luck. The outcome of the research shows that people who describe themselves as lucky share one common characteristic: they are all exceptionally good at looking for and recognising opportunities. Wiseman’s luck strategies are actually banal: maximise random chances, listen to intuition, have confidence in your future, recognise luck in misfortune. One explanation as to why some people are less lucky (less successful) than others can be found in an experiment carried out by Wiseman in 2003. His experiment follows that of Stanley Milgram Small World Experiment which suggests that each human (social member of society) is connected to every other human in the world by a surprisingly short chain of acquaintances. Wiseman’s experiment began with Internet posts inviting the general public to participate and some 500 people applied. 100 were then randomly selected and handed a package with the task of forwarding it to ‘Katie’, a 27-year-old student of art and history at Manchester University, who once worked in public relations in London, and enjoys cycling. All the initial volunteers and subsequent recipients were asked to send the parcel only to someone they knew on first-name terms. Ten per cent of the parcels eventually reached Katie and amazingly, there were just four people in total linking the initial volunteers with Katie. The tiny number of people linking the volunteers to Katie supports the idea that humans may indeed all be linked to one another via a remarkably short human chain. ‘The Luck Factor’, published in 2004 by Richard Wiseman, reveals that lucky people frequently experience the ‘small-world’ phenomenon, and that such lucky meetings have a dramatic and positive effect on their lives. In contrast, unlucky people rarely report small-world experiences. However, in his experiment approximately 20% of the volunteers did not forward their parcels at all, guaranteeing that their packages would never reach Katie. These volunteers had gone to considerable lengths to ensure that they participated in the study, but had then dropped out at the very first stage. Interestingly, the vast majority of these people had previously rated themselves as unlucky. These people hadn’t even tried to achieve success and had given up at the first opportunity (here is the complete description of the experiment). The conclusion of this experiment is that luck and success depend on taking opportunities and that people who are not shy in creating and seizing opportunities seem to be more successful. Have you ever heard the term “self-fulfilling prophecy”? Proof of this concept was recently attempted by Derren Brown in a UK Channel 4 TV show. 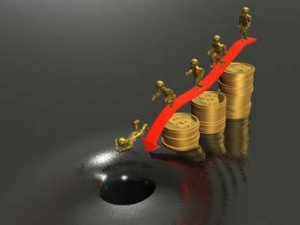 He tried to show that if people begin to believe in luck, their attitude changes positively towards opportunities and as a result they become better off or more successful. To conduct this experiment, a small northern English town was selected and a rumour begun about a statue in a local park which was bringing luck. The Channel 4 team helped a little by engineering a few lucky coincidences and within only three months the experiment took on a life of its own. The rumour spread, attracted the interest of the regional press and many people started to report lucky experiences and coincidences (without any further effort from Channel 4!). The Channel 4 team also carried out a few experiments in the background and observed that the people who believed in the lucky statue became surprisingly more successful than others. These people were more open to new opportunities, concentrated on reaching success and thereby catapulted themselves into the newly formed group of lucky people. However, please be cautious! Believing only in luck and grabbing opportunities is not a warranty for success (although Derren Brown’s show seems to suggest this at the end, be reminded that it was only a show and he is a master of illusion!). On the other hand, surely a strong belief in hard luck and permanently omitting opportunities does not lead to constant failure? Seneca, a Roman philosopher and politician (5 BC-65 AD) is known for his saying: Luck is what happens when preparation meets opportunity. Sending a package to a stranger via acquaintances – a large circle of friends and an excellent social network requires a lot of effort to build and maintain and therefore it surely belongs to the set of “preparation”. If then an opportunity comes along, success (luck) strikes faster since there is simply a larger intersection between the two sets: preparation and opportunity [expressed in mathematical terminology]. 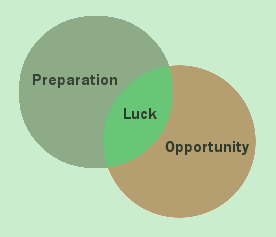 Believing in a lucky charm – preparation (a lot of work) is not really much use if opportunities are hardly ever taken [the intersection of the two sets, luck, then remains empty or is much smaller than compared to other people]. Despite belief in luck and many opportunities to gamble the gambler must never forget that luck (success) is a subset of preparation and opportunity. Gamblers, however, seem to have the tendency to focus on the many opportunities and in a firm belief in luck; somehow the ‘preparation’ falls behind. Unfortunately this is not a formula for success: If luck is defined as a subset of preparation and opportunity then one can omit neither of these elements. When gambling it seems that there is exactly the opposite psychological rule compared to social behavior: If people in social environments are inclined to work hard (preparation) and are quite careful and sometimes even reluctant in seizing new opportunities, it seems to be the opposite when gambling. The majority of gamblers seem to be people who are rather inclined to seize opportunities but keep the preparation (work) at a minimum. Be reminded of the fact that casinos and bookmakers earn their profits via statistics and probabilities (percentages) and there is a memorable saying by the statistician Chip Denman (Statistics Laboratory at the University of Maryland): Luck is only probability which one takes personally. If a coin is thrown ten times and lands eight times as a ‘head’, it is tempting to believe that the next throw must be a tail. Unfortunately this is wrong thinking. The coin does not have a memory and the next throw has exactly the same chance as all the preceding ten throws: a 50% probability for ‘heads’ and 50% for ‘tails’. Margaret Thatcher once commented upon praise she was given when receiving a school prize at the age of nine, “I wasn’t lucky, I deserved it!”. Nevertheless gamblers often believe in ‘lucky streaks’ or ‘hot tables’ or even attach superstition to a particular number. There is simply no need to be fooled as the majority of gamblers tend to lose more than they will ever win. 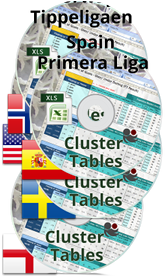 Soccerwidow’s blog is about statistical analyses, probabilities, evaluation of historical data, strategies of sporting bets, gambling explanations, bookmaker mathematics, odds, et cetera. Perhaps you will take this opportunity and become a Guest Author for Soccerwidow. Who knows where this opportunity will lead you in life? Always in the Red? Control your Banking Behaviour!